Venice. Birgit Wolfram’s series Lichteinfälle will be exhibited for the very first time by travelling art gallery Kajo Collection at Palazzo Zenobio in Venice, Italy. The doors of the Palazzo Zenobio open on 15th of August at 7pm and the exhibition ends on August 30th. Wolfram’s innovative point of departure arises from the desire to create a fictional romance, portrayed in a documentary fashion. Contingent photo fragments are isolated from their original connections to time – yet conceiving distinct durability. 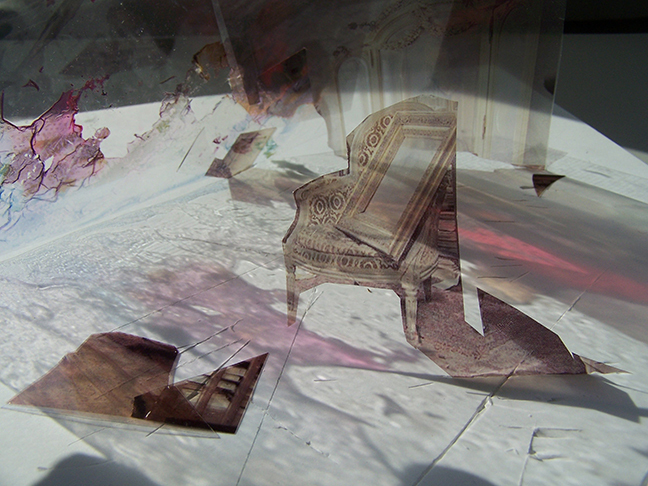 Wolfram creates a novel dimension between space and time as the viewer observes photorealistic structures at the very same time the audience is confronted with the boundaries of the photo fragments. Therefore, a discourse of fictional and non fictional elements occurs in Wolfram’s compositions. Hence, an enduring reflection on time and space is inscribed into her artistic oeuvre. The life span of photo fragments expands transforming into paintings, which find a new habitat proposing a tangible and tactile composition. A new, salient method is Wolfram’s way of adding shadows and staccato light to pattern, directing an entirely unique style for the benefit of the compositions. While the viewer’s eye travels through the underlying pattern, the subject matter undergoes varying light situations, transitioning from shadow to light. Her paintings speak to the moment of revealing something previously hidden, depicting either dark drama or sheer beauty. In contrast to classical photorealism were the entire content of a photo is portrayed, the photo fragment gives rise to the composition and is seen as an isolated and authentic subject of the painting. Transparent elements and the analysis of light and shadowstructures give reason to the name of the series: Lichteinfälle. According to Maurizio Pellegrin: “The work carries a sense of stillness. She forces the elements, no matter if the fragments have an energy or a movement, and they are still displaced for a unity. An atmosphere of displacement, a spatial romanticism where the place is totally absent.” Birgit Wolfram lives and works in Brooklyn, New York. She has won several awards, such as the Vasari prize and her latest residency award was NES Residency, Iceland, 2014. In 2010, she debuted with her first solo show in New York. She has held a teaching position in the department of painting at Kölner Malschule. Germany. Her work is part of several private collections worldwide. Her work is part of numerous private collections worldwide and has been on displayed by prestigious galleries, including the National Academy Museum. Kajo Collection is a travelling fine art gallery with the mission to support and promote contemporary artists all around the world. The gallery circles the globe to expose artworks of contemporary artists to encourage a new way of artistic observation – inviting its audience to detect the unnoticed in the already seen, yet the visible in the invisible. Kajo Collection aims to redefine the concept of space while constantly exploring new locations to exhibit its artists around the world.